Projects are “defined” in specific, actionable terms designed to make execution possible and to facilitate informed actions and decision making. The definition is essential to secure stakeholder buy-in and acceptance, to negotiate priorities and to ensure that proper expectations have been set regarding the work effort that lies ahead and the results to be produced. 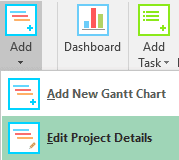 Click on the Add Gantt Chart button on the Gantt Tab inside the Excel ribbon. This will open the Project Details window. Tip – You can change this option later as well if you change your mind. Baseline Budget – The original estimated budget should be entered here and this should not ideally be changed. While the estimated budget may change over time the baseline budget should not be changed. This gives management a fair idea as to what the original estimation was and helps them compare this with the Estimated Budget and the Actual costs of the project. Click the Ok button when you have entered all the information. As soon as you click the Ok button a new excel worksheet with a Gantt chart timeline is magically created for you. A task is also added by default to give you a jump-start. 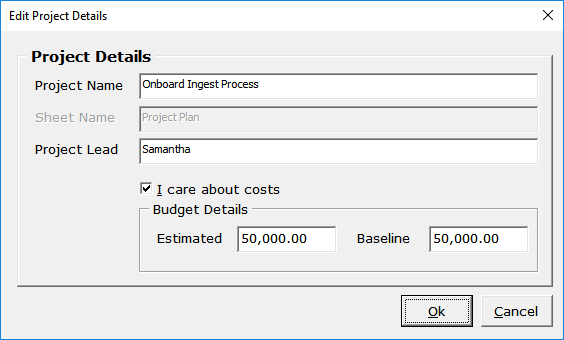 Double-click the Project Name in the Gantt Chart or click the Edit Project Details button and this will open up the Project details window. Make changes and click the Ok button.